Do you have one of your grandparent's suitcases burning a hole in your attic? Or a creative flair that you're dying to use in a fun and unique way? Or have you long ago lost your favourite instrument but still have the case? 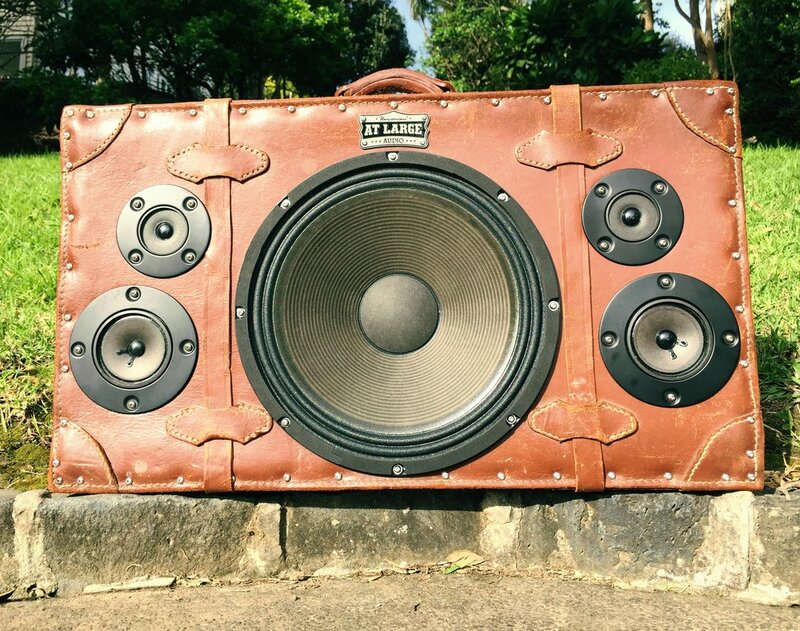 Whatever the 'case', we can work with you to create your very own customised speaker system, breathing new life into your old case. We will work closely with you throughout the whole process to make sure your personal vision is realised. Just click on the button below to get in touch, or call us by finding our details here. And have a look below at our latest Custom project below as well. Dannys' Custom Suitcase, see below for the full story. Danny got in touch with At Large Audio after seeing one of our cases in Viva Magazine. His father had immigrated over from China and bought some amazing luggage with him. It was one of these pieces that Danny wanted At Large Audio to customise into a speaker system for him. At Large Audio were up to the challenge. First we met with Danny to check out the case, and determined that it would make a great speaker box. Then we decided on the specs Danny would like in the sound system. We decided on incorporating a nice big 12 inch speaker, Bluetooh and 3.5 connections with 10+ hours of battery life. We then researched some speakers and sent Danny some options of speakers and designs for him to choose from (see designs below). When dealing with such a piece of history we wanted to make sure that Danny was involved in the design process and that the final piece would be something he would love for years to come. When cutting into the suitcase we noticed an amazing logo that had been stamped into the leather of the suitcase in the very middle of the front of the case (where we were putting the 12 inch speaker). It looked a lot like a badge so we saved this piece to later turn into a badge and tie around the handle. This was a piece of history that we had to preserve. After a few final tweaks to the crossovers we were ready to hand deliver this to Danny and for him to take home. He was completely stoked with out outcome and especially the badge, and the way we managed to keep the leather straps of the case. This was a true collaborative project with a piece of history and the team at At Large Audio could not have been more proud to work on this with Danny.